He was just a kid from Lubbock, Texas, sporting black horn-rimmed glasses, blue jeans, a white T-shirt, white socks and loafers. And he changed the course of music history. Gary W. Moore, the award-winning and critically acclaimed author of Playing with the Enemy, was never confused with real Buddy Holly fans. Unfortunately, due to sales rights restrictions, we cannot offer Hey Buddy for sale in your country. He was just a kid from Lubbock, Texas, sporting black horn-rimmed glasses, blue jeans, a white T-shirt, white socks and loafers. And he changed the course of music history. Gary W. Moore, the award-winning and critically acclaimed author of Playing with the Enemy, was never confused with real Buddy Holly fans. Gary was not a fan of rock music or what he believed it represented in our culture. He was familiar with Buddy's name and thought he was dead, but he couldn't name a single song Buddy had written or performed. In a single evening all that changed when the late great Buddy Holly reached out from a stage in Cedar Falls, Iowa, and seized Gary's heart and soul through a song. Not a song written or performed by Buddy, but a song about Buddy performed by musician extraordinaire John Mueller. Hey Buddy: In Pursuit of Buddy Holly, My New Buddy John, and My Lost Decade of Music is a warm and intimate chronicle of the author's personal journey to discover more about Buddy himself, his music, his influence, and the times in which he lived. Join Gary as he meets Buddy's personal friends and family members, celebrities, and everyday Buddy enthusiasts. Their unique and intimate stories will make you laugh, smile, cry and think, all the while wondering"what if?” What if Buddy had lived instead of perished in that terrible plane crash in Clear Lake, Iowa, on that winter night in 1959? What if Buddy had continued to write music into the 1960s and 70s? His dramatic and enduring legacy influenced everyone from the Beatles and The Rolling Stones to writers, fans, and John Mueller, who took the stage in Iowa one cold night not too long ago to recreate the Winter Dance Party of 1959, and in doing so, influenced an author to pick up his pen and explore a legacy that still affects us today. 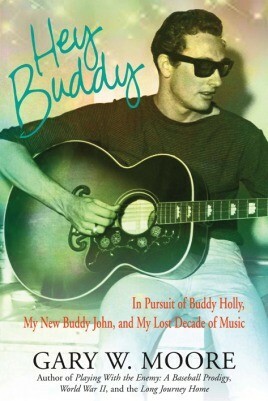 Hey Buddy is a page-turning pursuit of Buddy Holly's legacy and his impact on others in and out of the music industry. It's as American as apple pie and as compelling as Don McLean's legendary hit about The Day the Music Died. Run, don't walk, to your nearest bookstore and get two copies—one for you and another for anyone you know who listens to music. Gary Moore's Hey Buddy is a touching narrative that chronicles his fascinating journey of discovery into the life and music of Buddy Holly through the spirited performances of John Mueller while endeavoring to explain the profound impact Buddy's musical legacy continues to have more than fifty years after his tragic demise. A rock-and-rollercoaster of a read! Gary Moore's emotional account of his discovery of Buddy Holly and the eye-and ear-witnesses of Holly's genius is a memorial to the influence of one of rock's true pioneers. You'll ‘Rave On' about this unforgettable story! We've all had Uncle Charlies in our lives who were fun to be around because they told such great stories; we always wanted to hear more. For me, Gary Moore is the ‘Uncle Charlie' of American writers. He is a great storyteller through the written word—and I always want to read more. Now he's done it again with Hey Buddy. Hey Buddy illustrates the raw power that passion for a topic can have when it grips an unsuspecting writer. Author Gary Moore is not only a gifted storyteller but an accomplished musician and a pilot, and he uses these attributes to provide new and unique insights into Holly's music, his all-too-brief life . . . and his death. Buddy Holly inspired a generation of musical greatness. But in many ways, he was very different from the musicians he inspired in his short life. These differences are what allowed a former rock n roll naysayer to finally come to grips with his musical prejudice. In discovering Buddy, Gary Moore learns as much about himself as he does about a generation of music he had selectively tuned out. Hey Buddy allowed me to walk on this journey with him. It is really terrific—sweet, sad, informative, and even patriotic. This is a great read for anyone remotely interested in music and why it does or doesn't make us tick.
. . . a thoroughly fun read [and] crazy good. This book is a warm and intimate chronicle of the author's personal journey to discover more about Buddy Holly, his music, his influence, the times in which he lived and ultimately his untimely death. There are bits that gave me goosebumps -- reading about such a talented kid being snatched away so young in such tragic circumstances will surely do that to anyone. ...this book will surprise many of you.... for it is quite unlike anything else I've read. A comfortable read and recommended as a gentle introduction to the man who was Buddy Holly, and a probe into the mind of the author whose obsession as a new fan grows stronger every page. This book will probably have the reader wondering what might have been if Buddy had survived, but also what if Gary Moore had picked up a Fender in 1957.